Chamomile or camomile is a common name for various daisy-like plants that are best known for their ability to be made into a tea. This tea is commonly used to help with sleep and is generally served with either honey or lemon. The plant is also used to produce a green color for dyes. This Wildcrafted Oil contains chamazulene, a-bisabolol, bisabolol oxide A, bisabolol oxide B and bisabolone oxide. 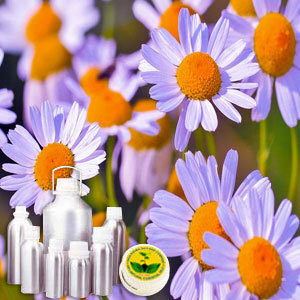 A medium middle note, Chamomile Essential Oil has a soft, woody fragrance similar to that of Moroccan Chamomile. It mixes well with bergamot, clary sage, lavender, geranium, jasmine, tea tree, grapefruit, rose, lemon and ylang-ylang. Owing to its therapeutic properties, this Wildcrafted Oil provides a calming effect on the mind and body. It is beneficial in treating any type of internal or external inflammation and is also effective on urinary stones as well. This oil is also valuable in treating menstrual and menopausal problems.